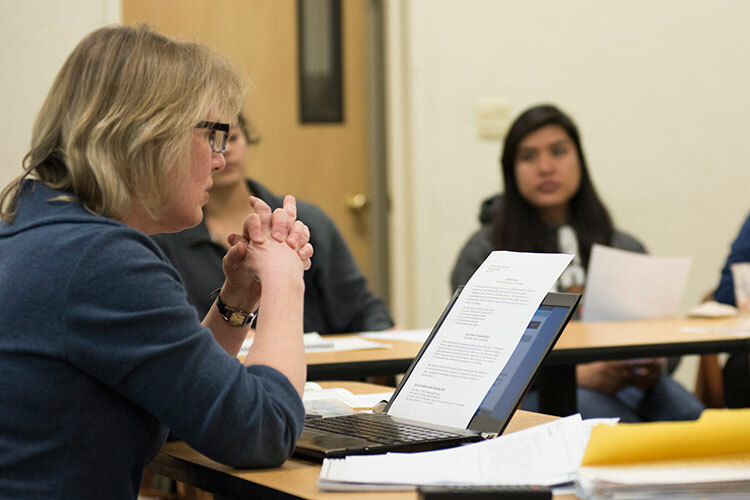 Professor of English Cynthia Westerbeck leads discussion in the Honors course “Analyzing the Arts." The Honors Program at Pacific Union College provides an alternative to traditional General Education requirements, enrolling students in classes that depart from a traditional lecture format to encourage a lifetime of critical thought, aesthetic appreciation, and spiritual prosperity. Recently, the program was reinvented to meet the needs of more pre-professional students while still retaining its great books legacy and liberal arts tradition. According to Hill, the program underwent its makeover in the fall of 2014 to create scheduling flexibility, add more variety, provide cross-cohort classes, and offer the opportunity (but not the absolute requirement) of an abroad seminar. Though significant changes await the Honors Program, there are several aspects that will remain unaltered: the program will continue to provide a core sequence of seminars that focus on deep understanding of serious issues through reading, writing, and discussion. Likewise, the summer seminars abroad and the senior capstone Honors project remain integral to the new program. Though the number of required seminars has been reduced, the deficit is made up with electives called H-courses. H-courses are open to PUC’s entire student body, so the program has a chance to become less encapsulated and evolve into a more diverse community, while providing more schedule flexibility and giving all students access to unique, in-depth courses. Honors students are also required to take several cognates to round out their studies, which include a lab science, statistics, and two physical activity courses. Regardless of the changes to the Honors Program, current and future students can rest assured that the program will continue to live up to its mission to educate seekers of truth, distinguished scholars, and capable leaders.